My girls are big fans of pork ribs. We generally smoke and BBQ our ribs, but last week I introduced them to another method for cooking ribs; braising. There are two steps in braising meat. First, you sear the meat on high heat to lock in the juices and to create the beautiful color on the meat. Second, simmering the meat in liquid over an extended period of time breaks down the muscle fibers in the meat and makes it ultra tender. In my family, this comfort food dish is known as Sườn Ram Mặn. The ribs are sticky and fall off the bone tender and packed with copious amounts of savory goodness. This dish is a perfect family style meal and pairs perfectly with Vietnamese style vegetable soup and a steaming hot bowl of white rice. Parboil Ribs – Add ribs to a medium pot and cover ribs with water. Bring pot to a rigorous boil for 10 minutes. Remove ribs from pot and wash each piece thoroughly. Marinate Ribs – Add ribs, fish sauce, sugar, black pepper, caramel color, minced shallot, and minced garlic into a medium bowl and mix well. Allow ribs to marinate for at least an hour. 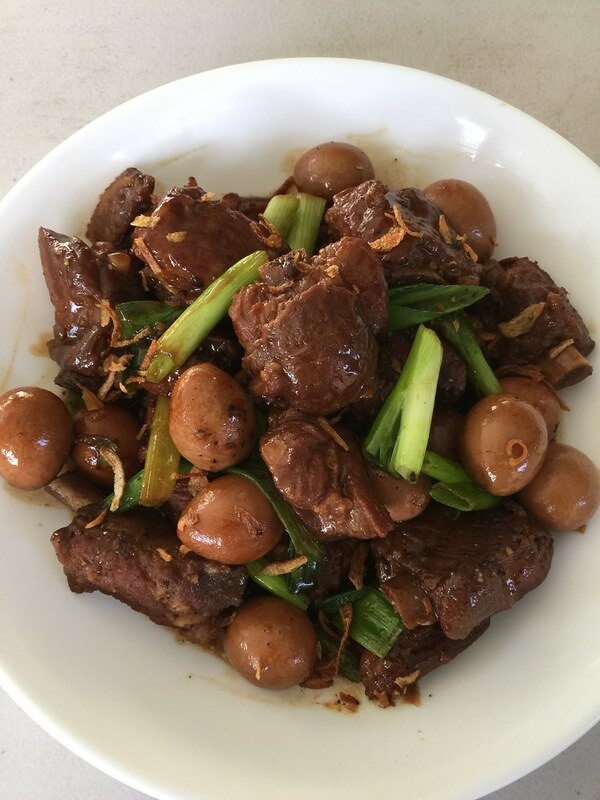 Braise Ribs – Heat skillet or wok on medium high heat. When the pan is hot, add 2 tablespoons of vegetable oil. Add ribs plus juices. Sear ribs for 2 minutes on each side. Add quail eggs, coconut juice, and water. Give everything in the pan a quick stir. Cover pan with a lid and reduce the heat to medium low. Braise for an hour. After an hour, increase the heat to medium and simmer ribs uncovered for about 15 minutes or until sauce is reduced to your liking. Turn off heat and gently combine the green onions with the ribs. looks great, going to try this tonight!